Come next Friday morning all those who have posted a track will be put in the soul source top hat and a winner will be drawn out. 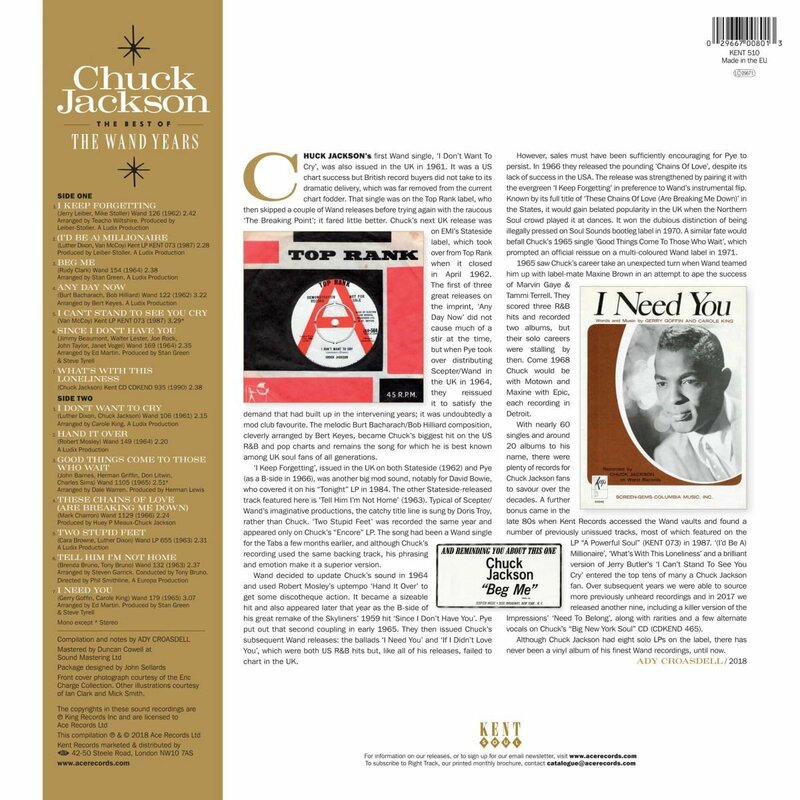 Chuck Jackson had eight solo LPs on Wand but there has never been a vinyl collection of his greatest recordings for the company … until now. More album info and purchasing options via..
Hard to pick just one, but I Keep Forgettin' is never far away from the deck. Hand It Over.... what a great artist! Hand It Over for me too - tune. What's with this loneliness for me too. I remember buying a copy on Stardust from Rob's in Hurt's Yard in Nottingham out of a tatty old suitcase on a pile of dusty and mostly sleeveless records. 'What's with this loneliness' for me too - can't believe it never got a release at the time. Getting Ready for the Heartbreak. Total classic. Good things come to those who wait. I remember sending a soundclip of this to Diageo in the early 80's and suggested that they use it in a Guinness Commercial..Never heard anything back..
What's With This Loneliness but it could easily be several others. Hand It Over, probably my favourite. ‘What’s with this loneliness ‘ also for me ! What’s With This Loneliness is fantastic but I recently came across Beautiful Woman flip to I’ve Got The Need which is a really nice modern soul tune. The track that introduced me to the man back around 64 -- ANY DAY NOW. i cant stand to see you cry. 'Good things come to those who wait'. For those of us who danced and loved to 'These chains of love (are breaking me down)' and 'Any day now' this track was a corker. I loved this after being used to only hearing the first two played at The Wheel until this broke, so to be given new and exciting material from Chuck Jackson was just great and worth the 'wait' to discover it. Has to be, Any Day Now, that's the one I heard first of his. Yes it's the same for me too. I Just Don't Know What To Do With Myself. Don't bother with movies. They'd only make you sad. Or parties. They'd make you feel as bad. What am I Gonna Do Without You was the first Chuck Jackson song I heard and I have loved it ever since. Has to be "What's With This Loneliness"
"I only get this feeling" for me.